In this mind-bending psychological thriller, college student Henry Lethem (Ryan Gosling) plans to kill himself in three days, unless psychologist Sam Foster (Ewan McGregor) can save him. After his first encounter with the disturbed young man, Sam finds he's losing his own grip on reality, as he, too, is thrust into a nightmarish place between life and death. With the help of his girlfriend (Naomi Watts), Sam races to unlock the dark secrets of Henry's tortured psyche in this suspenseful chiller that will keep you guessing right up to the shocking ending! $2.188 million on 1684 screens. 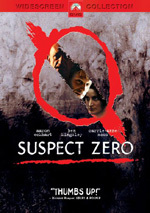 When the DVD for Suspect Zero arrived on my door in the spring of 2005, I was shocked to learn it enjoyed a fairly wide theatrical release the prior summer. I’d never heard of it and thought it was a direct-to-video product. I pay attention to new movies so I couldn’t figure out how this one slipped by me. The same sense of surprise came when I received the DVD for 2005’s Stay. The movie appeared in theaters during the fall and played on a maximum of 1684 screens. That’s not a huge release, but it’s enough that I should have been aware of the flick. However, I’d never heard of it. The talent involved in the movie made this even more surprising. With 2004’s Finding Neverland and 2003’s Monsters Ball, director Marc Forster was fresh off of two well-received films. And while Ewan McGregor and Naomi Watts aren’t quite household names, they’re well-known enough that they should have drawn some attention to the flick. Maybe I was passed out drunk when it hit the screens, but Stay never made my radar screen. That’s too bad, as the movie offers a pretty involving and offbeat experience. Stay introduces us to psychologist Sam Foster (McGregor). Though he usually deals with neurotic stockbrokers, he occasionally does work with students at the local university. There he meets Henry Letham (Ryan Gosling) when he fills in for another shrink. The apparently schizophrenic Henry tells Sam that he plans to kill himself in three days. This hits home for Sam since his girlfriend Lila Culpepper (Watts) once tried to off herself. When Sam tries to help Henry, he finds a series of weird experiences. These get deeper and deeper as the movie progresses. To say the least, Stay presents an unusual flick. It keeps us off-guard from start to finish, and it disrupts us with its awkward camera angles and choppy editing. Actually, “choppy” isn’t the right word, as it implies crude or poorly executed. The cutting flows quite smoothly, really, as it creates a weird sense of space and time. It certainly isn’t conventional, though. The editing acts as a major element in the film. The Sam and Henry characters often flow into one another, and various pieces echo and repeat. The cutting never calls attention to itself. The movie doesn’t use it in an artificial, showy manner. Instead, the editing acts as a prominent feature to form the flick’s strange mood. All of this it does quite well. I’m not too proud to admit that I think Stay is a confusing film and one that I can’t claim to fully understand. However, I don’t see this as a flaw. Stay throws a lot at the viewer and functions more as an atmospheric experience than a coherent narrative. Normally I’d use that phrase as a criticism, but Stay drew me in well enough that I didn’t mind the moderate confusion. It’s the kind of movie that would clearly benefit from a second – and probably third – screening to try to make better sense of it. Who knows – perhaps it’s really a mess and no amount of viewings would clarify matters. I suspect that’s not the case, and once you have a better grasp on the flick’s world, it’ll be easier to follow. In any case, Stay works the first time through if for no reason other than it’s fascinating to watch. The film really throws the viewer for a loop but doles out just enough drama and information to ensure continued interest. It’s a trippy little flick that I plan to watch again. 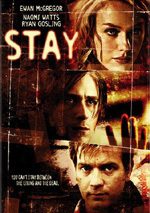 Stay appears in both an aspect ratio of approximately 2.35:1 and in a fullscreen version on this double-sided, single-layered DVD; the widescreen image has been enhanced for 16X9 televisions. Only the letterboxed picture was reviewed for this article. This transfer usually looked fine, but it lacked the merits to make it much above average. For the most part, sharpness seemed positive. However, softness crept into wide shots, as edge enhancement made these moderately indistinct. Otherwise, most of the flick appeared acceptably well-defined and detailed. Some minor edges and shimmering occasionally occurred. Other than a speck or two, print flaws seemed absent. Stay presented a limited palette that featured largely stylized colors. Within those constraints, the tones looked fine. They were reasonably concise and vivid. Black levels seemed fairly deep and firm, while shadows were somewhat up and down. Many shots offered good delineation, but others became a bit dense. Ultimately, Stay seemed a little too erratic for my liking. As for the audio, Stay included a Dolby Digital 5.1 soundtrack. Overall, the audio seemed good, mainly due to the many trippy scenes. The soundfield mainly came to life on those occasions. It used the rear speakers effectively for the scenes that dealt with those elements and created a lot of cool effects. Those worked nicely and accentuated the film’s mood. Outside of those situations, the mix stayed pretty subdued. It offered nice stereo imaging for music and a general sense of ambience, but not much more than that. Still, enough of these freak-out bits occurred to make the track active and involving, and it featured the surrounds in a creative manner. Audio quality appeared solid. Speech consistently came across as natural and concise, and I noticed no issues related to edginess or intelligibility. Music seemed clear and vivid, as the score presented firm tones. Effects also appeared clean and accurate. They suffered from no distortion and boasted fine bass response during the appropriate sequences. In the end, the audio of Stay served the movie fairly well. A small mix of extras fills out the DVD. We get two “scene-specific” audio commentaries. The first comes from director Marc Forster and actor Ryan Gosling. They sit together and chat for 23 minutes, eight seconds. Forster and Gosling go into issues like the movie’s visuals and other stylistic choices, rehearsal and work among the actors, editing, and story topics. At no point does the commentary threaten to become particularly enlightening, but it offers some decent production notes. It proves interesting enough to keep us occupied for its short period. The second track features director Marc Forster, director of photography Roberto Schaeffer, editor Matt Chesse and visual effects designer Kevin Tod Haug. All four sit together for their discussion. They talk about technical issues. We get information about transitions and editing, cinematography, locations and sets, and visual effects. A few story issues pop up as well. Forster becomes a moderately frustrating participant at times. He really wants to keep the “magic” of the film alive, so he squelches remarks that might shed a little too much light on the story. Nonetheless, we get a pretty good overview of the movie’s nuts and bolts. The guys seem candid and lively as they go through the important issues related to the technical elements. They make this an interesting and entertaining piece. In addition to the film’s theatrical trailer, we find two featurettes. Departing Visions runs seven minutes, three seconds and gives us remarks from folks who claim to have gone through near death experiences. We listen to Reuben Beckham, “Nancy”, “Peter”, and “Cristael”. They discuss what they say happened to them and how these doings affected their lives. I don’t know how much I buy the reality of their claims, but this is a moderately interesting first-hand discussion. Finally, The Music of Stay goes for eight minutes, 19 seconds. It features information from composers Thad Spencer, Tom Scott, Chris Beaty, and Richard Werbowenko. They discuss instrumentation and the use of different techniques through the movie. They provide a good examination of the music and its interpretation into the flick. Stay occupies the same spooky afterlife territory as something like The Sixth Sense, but it approaches its subject from a notably more obtuse angle. I don’t see that as a negative, though, for the film manages to remain consistently provocative and intriguing. The DVD offers reasonably good picture and audio along with a roster of moderately informative extras. This intriguing movie deserves a look.